The Monterey Plaza Hotel & Spa is offering a package special for $299 a night plus a $75 resort credit for each night if you book an ocean view room Sunday - Thursday (until October 29.) The Plaza is the only Mobil 4-star rated hotel in Monterey and is located on Cannery Row. The hotel offers spectacular views of the ocean, as well as wonderful spa amenities, and great dining in their various restaurants. Early Fall is a great time to go to Monterey as the peak tourist season has died down and the weather is still great, although fog is a possibility. I've been to Monterey a number of times in late October and definitely recommend going then. The first time I went the weather was cool and foggy, but the other times the weather has been sunny and pleasant. With less tourists in town, the attractions, shops, and restaurants are not as crowded, thus making for a more relaxing and enjoyable vacation. 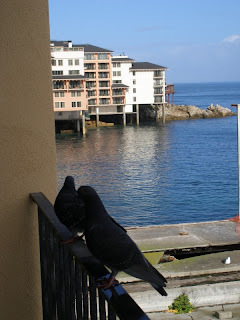 For more Monterey tips and information, check out my previous blog posts relating to Monterey and Monterey Bay.